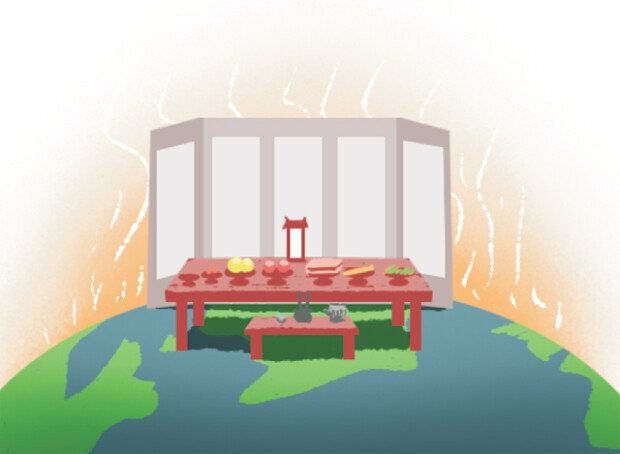 Global warming effects on Korean ritual tables. February. 09, 2019 08:44. yes@donga.com. The Lunar New Year’s holidays have just passed. With a variety of food prepared during the holiday season, Koreans get together and have fun with their family and relatives. As tradition practices, family members are to prepare food and set the table for jesa, the Korean traditional ritual to commemorate their ancestors. However, more and more Korean families have opted to buy groceries online and take advantage of meal kits or hotel-provided catering services. It comes as surprise that such changes have recently occurred in Korean ritual culture. More surprisingly, places of origin of food ingredients on the ritual table have become different. The great example is pollack pancakes. Although pollacks were widely popular in Korea back in the 1970-80s, they have reduced in numbers these days, making it hard to see them on the dining table. With a decreasing population of Korean pollacks in the sea, Korea has imported them from Russia. The decreasing number of the once-popular fish has been caused by over-fishing and rises in water temperatures around the Korean Peninsula due to a warming planet. In particular, the East Sea sees a temperature rise 1.5 times faster than the average increase in the sea. As such, pollacks are caught in regions different from the past. Apples, placed on the east side on the ritual table, are produced primarily in North Gyeongsang Province centered around Daegu, Gyeongsan, Yeongcheon and Gyeongju. However, apple production has risen in regions of high-altitude in Gangwon Province such as Jeongseon, Yeongwol and Yanggu while decreasing in the traditional production regions, making it easier to have access to apples from Gangwon Province. Sweet persimmons are another example. Traditionally produced around Gimhae, Changwon and Miryang, they are currently raised across the farther northern regions including Pohang, Yeongdeok and Chilgok. Weather experts jokingly say that the pine tree in Mt. Namsan described in the Korean anthem may have to be modified to the palm tree as global warming rose as one of the major issues. As the changes seen on the Korean ritual table, onions and pollacks from other countries of origin have sneaked into food culture. Without our knowing, ingredients from farther north and Russia replace those traditionally produced in southern regions and Korea. Indeed, the joke has become a reality. Inaction against global warming would lead to major changes to the ritual table setting not to mention countries of origin of ingredients.